GARDAÍ HAVE APPEALED for information in relation to a serious collision that happened on the N7 Naas Road at about 3.45pm on Thursday, 28 December. 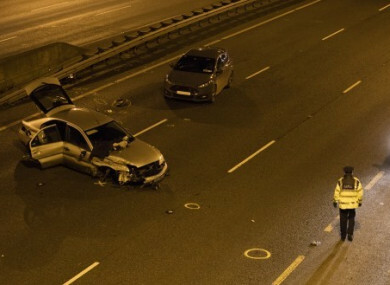 Investigating officers in Co Kildare said they are “particularly anxious to speak to any driver who may have dashcam footage of a silver Ford Mondeo driving dangerously northbound prior to the large collision”. Three teenagers were arrested and one person hospitalised after the crash in last month. At about 3pm on 28 December, gardaí received a report of a burglary at house in Athy. The intruders fled from the scene in a waiting car when the occupants of the house returned home. During a follow-up operation, members of a garda anti-burglary unit intercepted a car on the N7 at approximately 3.45pm. The car initially stopped for gardaí but, when approached, took off at speed in the direction of Dublin. Moments later this car was involved in a collision with a second car at on the N7 at Junction 8, Johnstown. One of the occupants of the car, a man in his teens, was injured in the collision and was taken by ambulance to Tallaght Hospital. Three other youths, all male and in their teens, were arrested during follow-up searches near the crash site a short time later. The driver of the second car was taken to Naas Hospital with minor injuries. Anyone with information or dashcam footage has been asked to contact Naas Garda Station on 045 884300, the Garda Confidential Line on 1800 666-111 or any garda station. Email “Gardaí appeal for footage of car involved in serious collision after burglary ”. Feedback on “Gardaí appeal for footage of car involved in serious collision after burglary ”.